Localized scleroderma is a heterogeneous disease, which is diagnosed by the occurrence of sclerotic plaques on variable sites of the integument. Usually the disease starts with an inflammatory reaction, which then develops in a fibrotic process. The underlying etiology is still unknown. The disease can be limited to a small number of lesions but can also spread over the whole integument leading to severe contractions. 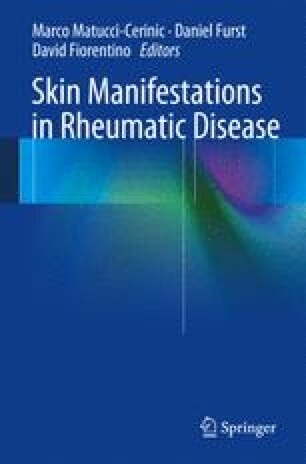 Based on the clinical presentation, four major types of localized scleroderma (i.e., limited, generalized, linear, and deep) can be differentiated, which are in detail described in this chapter.